Python is a widely used general-purpose, high-level programming language. Due to its focus on readability, wide-spread popularity and existence of a plethora of libraries (also called modules), it is one of the most preferred programming languages for scientists and engineers. In this series of python tutorials, I will provide a set of lectures on various basic topics of python. The prime target audience for this series are scientist in non-programming fields like microbiology, genetics, psychology etc. who have some to none programming experience. Here is a brief list of topics I will cover per week. I will also post exercises at the end of each session, along with the expected outputs. You should plan to complete these exercises within 5-6 days, before the new tutorial is posted. You will be judging your exercises on your own. The goal should be to match your program's output to the expected output. To start working with any programming language, first thing you need is a working installation of that language. Today, we will go through installation of python on Windows machines. To keep things simple, We will be running our simple programs in google chrome browser, without any need of an installation. For later exercises, from Week 7 onwards, I would highly recommend getting access to a Linux/Mac machine. However, I will also provide doing the same things on Windows machines and Google Chrome as well. In this week's session, I will be assuming you will be using online python in google chrome. To follow these tutorials, please run any code and observe output that you see in code blocks. Go to the following website to get access to python. You can work with this system in two ways: A. Write your code interactively (one command at a time) on the dark screen on the left. Pressing ENTER will show you the output of that particular command. The above program will simply output whatever was put under "quotes". We will learn more about the print() method (what is a method/function in python?) towards the end of this session. x is a name/symbol whose value is numerical and equal to 23. if we write something like this: y = x+12-5, then y is a new variable whose value should be equal to 23+12-5. We ran 3 commands. First we created a variable 'x' with a value of 23. We verified it value by using a print() method! Second, we created another variable called 'y' whose values is equal to mathematical operation of 'x+12-5'. If you remember basic algebra, this is exactly that. Finally, we confirmed that value of 'y' is exactly equal to 23+12-5. Here, we saved my name Sadanand Singh in a variable called "name". Concept of variable is very fundamental to any programming language. You can think of them as tokens that store some value. Lets consider this example to understand variable in more detail. You are doing your taxes, all of your calculations depend on your net income. If you do all your calculation in terms of actual value of net income, every time you write the number, your chances of making a mistake increases. Furthermore, suppose, you want to update the income due to some mistake in the beginning, now you have update every place where you used your income. Lets consider a second case where you declare a variable called "income", and store income = 30000. Now, any time you do any calculation with income, you will be using the variable "income". In this framework, because you have to type your income just once, chances of making mistakes are least and changing it needs just one change! Now that we know how to declare and use variables, we will look at first what all we can do with numbers in python. 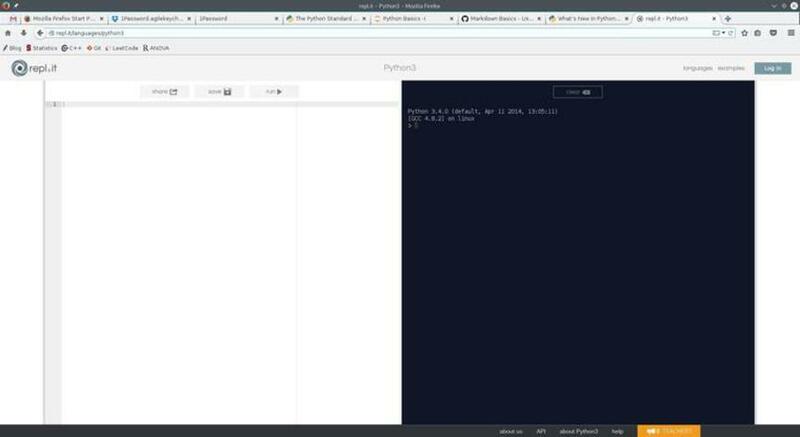 Using simple math operations are extremely easy in Python. Here are all the basic math operations that one can do in Python. Here are some example operation. Please repeat these and observe the use of parenthesis in using the BODMAS principle. What do you expect if we do b = -b again? You can all other available mathematical operation in this module on the python website. Primary way to see and print information on your screen in python is using a method/function called print(). We will learn more about functions in python later. For today, you can think of functions as a program that "does something". For example, the function print(), does the job of printing things on screen. Notice the use of () in functions. () separates a function from a variable. For example, "foo" is a variable, whereas foo() is a function, sometimes also called as method. Functions also have a concept of arguments. Arguments can be thought as inputs to functions. For example, we have function that adds 2 numbers, then this function will need 2 arguments, the two numbers that we want to add. We can denote this function as, addition(a,b). Similarly, functions also have a concept of return values. Return value can be thought as the output of that function. For example, in the above example of addition(a,b) function, sum of two numbers will be the "return value" of the function. We can write this as, c = addition(a,b). Here, a and b are arguments to function addition() and c is the return value of this function. A function can have any number of arguments, zero to any number; where it can have either zero or 1 return values. Now, coming back to the print() method, that we have been using throughout this tutorial. Now, lets try something fun. Can you explain what is happening here! We will all things we have learned today using the exercise below. Create a variable to store "income"
Create another variable called "taxRate" which is equal to 1/100000th of "income". Print following values clearly using print(): income, taxRate, Federal Tax, State Tax, Net Tax and Final Tax. Your output should look like the following in two cases. Great! Next week we dive into Python further.